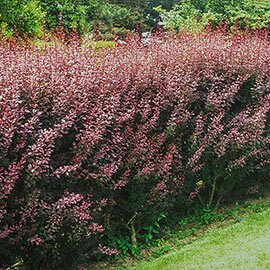 We love Rose Glow Barberry shrub for its vibrant color, attractive growth habit and versatility. It works equally well as a specimen plant or hedge—and you can plant it this summer. 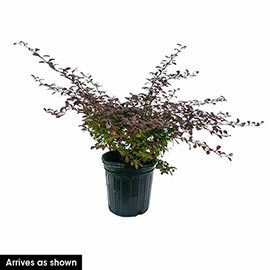 We ship each Rose Glow Barberry in a convenient gallon pot, ready for immediate planting. This is a deciduous shrub that grows 3-6 ft. tall with an equal spread. 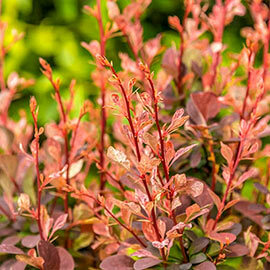 The gorgeous foliage features red and purple hues that turn to shades of orange, yellow and red in autumn. Rose Glow Barberry produces brilliant red berries that are a favorite of birds. Does best in full sun. Potted. Zones 4-8. Foliage: This low-maintenance beauty transforms from rosy pink with deep purple spots to red-purple and finally becomes bright red in fall. Flower Form: Does not flower. Growth Rate: Slow growth rate. Pruning: Prune hard to shape. Remove one third old wood to promote next year's flowering. Do not prune after August 1st.